The Model P-97 micropipette puller is the latest generation of the Flaming/Brown type puller for fabrication of micropipettes, patch pipettes and microinjection needles. While retaining many of the features on the Model P-87, the P-97 puller offers improvements in mechanical, electronic and software design. The result is better control of the pulling process and a higher degree of reproducibility. The P97 combines a proven mechanical system with a sophisticated, programmable microprocessor controller. This programmable control of the pulling parameters allows the investigator to design application specific pipettes from a wide range of glass compositions and sizes. A number of new features have been incorporated in the design of the P97 puller. One of the most apparent is the environmental chamber which houses the area surrounding the heating filament. The environmental chamber is designed to minimize the effect of changing humidity on the reproducibility of pulled pipettes. A 25% increase in power over the previous version allows for the use of larger heating filaments, larger diameter glass and multi-barreled glass. The metal jaws that clamp the heating filament have also been redesigned to minimize heat retention. A gas delivery mode switch provides for extended cooling for large diameter and multi-barreled glass. A spring-loaded clamping mechanism has been added for easier loading of glass. A vacuum fluorescent display has been added that allows easy viewing from any direction. New software improvements on the P-97 include a display of the total time that the heat is on to assist in program development and troubleshooting. Up to 100 programs can now be written and stored in memory, which makes the P-97 suitable for multiple users. These programs can now be write-protected, adding security to prevent programs from being changed or altered inadvertently. When a program is written and saved, it includes the date it was written or edited. In addition, the air pressure is included as a programmable item. The P-97 contains a ramp test to overcome the difficulties of program adjustment when a new filament is installed or to help characterize a new glass and filament combination. This test allows for the rapid adjustment of heat values in established programs and provides estimates for establishing heat settings when using new sizes or compositions of glass capillaries. 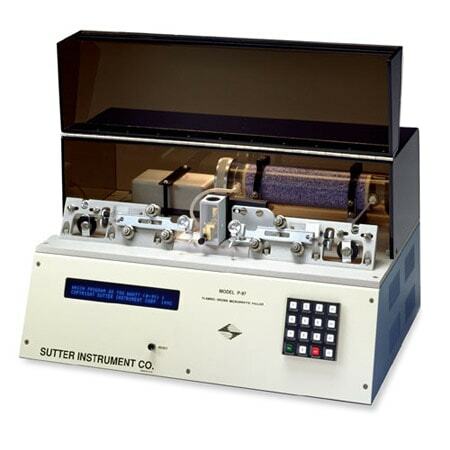 As with all Sutter instruments, the electronics have been carefully designed to maximize noise rejection. Memory storage for up to 100 programs. Write protection lock and date stamp. Two symmetrical pipettes with each pull. Preprogrammed sample programs for intracellular and patch pipettes. Special programming on request. Ramp test—self test for establishing program heat settings when a new filament or glass is introduced. Constant current power supply for filament and pull solenoid. Looping pull cycle for fabrication of patch type micropipettes. Self-contained air supply with filtration system and humidity control. Consistent and reliable electrodes with tip diameters less than 0.1um. Control over the time and pressure at which the air is delivered. Quality control, SEM photograph of a tip pulled with each puller; criterion is tip measurement less than 0.1um and typically is ~0.06um.